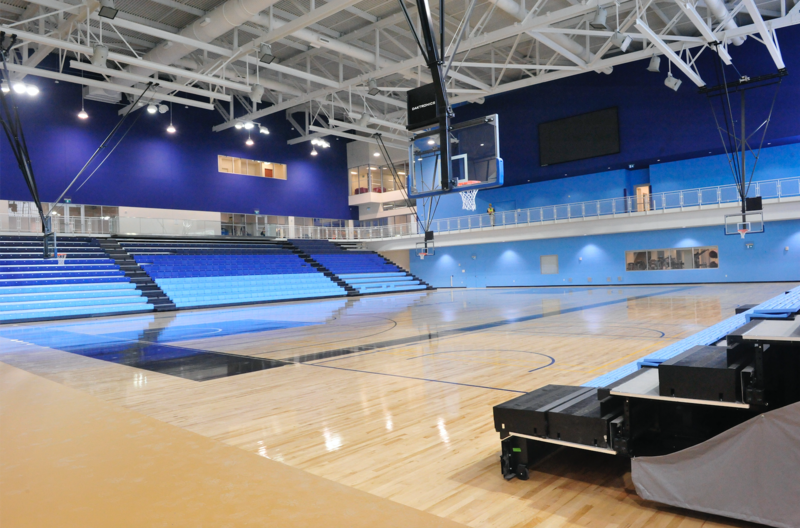 The 35,000 square-foot field house is a two-storey spectacle that includes diverse playing surfaces and a 200-metre track. Ideal for any sport or recreation event, the Gymnasium can be rented in its entirety or in separate venue features. One (1) full-size basketball court. One (1) indoor soccer pitch. The venue is also ideal for other activities such as wheelchair sports, archery, table tennis, floor hockey, lacrosse, gymnastics, cricket and pickle ball. Ideal for team practices, games or tournaments, the competition area features hardwood flooring and two (2) full-sized gymnasiums. Scoreboards and Daktronics shot clocks with international-standard court dimensions highlight the venue. In Showcase Mode, the competition court transforms into an ideal setting for high-profile events and houses adjustable bleachers for up to 1,386 seats.